Ideal for discreet surveillance. High-resolution colour camera. Static Dome Surveillance Cameras are ideal for viewing, monitoring and recording specific areas and events. 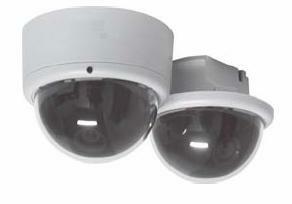 Technical details, specification and key features of static dome colour surveillance camera. The indoor colour dome camera encompasses the latest in colour Digital Signal Processing (DSP) technology. The super high resolution integrates a camera and lens into a single piece tamper proof, compact unit that can be surface or flush mounted for fast and easy installation. It is attractive and unobtrusive yet provides a crime-deterring round-the-clock with its excellent low light imaging protection. The compact surface mounts or flush one-piece mount design allows for fast, easy installation and a wall/pendant mount kit is available in off-white for inconspicuous installation in virtually any application. The housing is designed to easily mount directly to a ceiling or wall, and a 4S adapter plate is supplied with the unit for mounting over an electric box. A service/monitor cable is also included for easy on-site adjustments. The camera incorporates a 1/3’ CCD, offering 540 TV Lines of crisp, clear horizontal resolution with a minimum illumination of 0.6 lux. It comes equipped with a 2.8-10mm (F1.3) Vari-focal auto iris lens to cover a wide range of viewing angles. Picture adjustment after installation is easy with the 3-D axis gimbal that is capable of 360° of pan, 180° of tilt and 360° of horizontal rotation. It also features a tamper resistant lockable cover and a ‘cable management’ housing design for installations requiring the video and power connectors to be contained within the housing base. The camera accepts wither 12VDC or 24VAC (auto sensing) for proper operation and flexible installation. The backlight compensation (BLC) and auto tracking white balance (ATW) ensure crisp colour images in dark or backlit environments such as windows and doorways. The automatic gain control (AGC) feature increases the signal strength from the camera when scene lighting is low, keeping the picture sharp and viewable. The camera can reproduce pictures clearly down to the smallest detail, making it easier to identify subjects. It is the ideal solution in commercial applications-where surveillance must be discreet.